Think you're a hotshot? 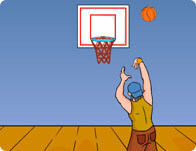 Test your ballin' skills with this fun basketball game. The higher points aren't further away, they are higher up, and with a three row of hoops constantly scrolling, it's possible to string together three swishes in a row! Collect power ups like wider hoops, slow time, and triple shot! Use the mouse to move and aim. Click the mouse to shoot. Adjust the power and angle of the ball and score as many as you can. Test your skill by tapping the ball into the basket. Don't let it drop down! Throw the ball into the basket and score points.